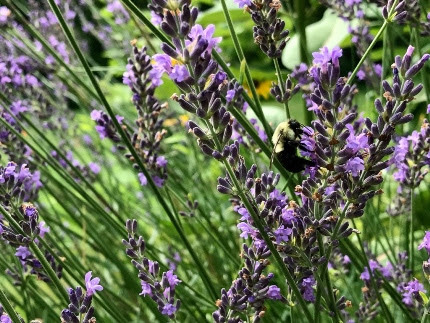 Nothing beats Lavender ‘Phenomenal’ for attracting pollinators to your garden. Plus, you get to harvest armloads of fragrant lavender! get to others. This is the gift of a rainy spring and summer. If you aren’t sure just what to do, join me this coming Saturday morning for one of our most popular walks of the season: The Great Summer Cutback. I will inspire you to cut back many plants harder than you would imagine so they will grow back full with nice lush foliage and perhaps even bloom a second time. We will open prune roses for the second time this year. I will also demonstrate how to deadhead. When you see me do it, you will be empowered. 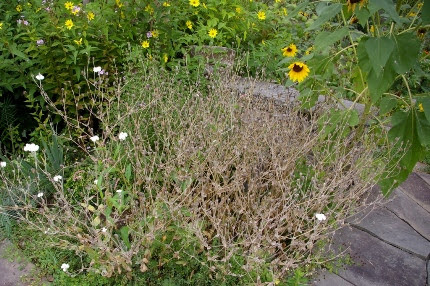 Once you have cut back your roses and repeat blooming perennials, it is important to feed them. I will also be demonstrating how we do that. We mix Pro Start (2-3-3) organic fertilizer and Coast of Maine compost. We then spread a few scoops around the base of each rose bush and at the base of butterfly bushes and select perennials. When is it? 10 am this Saturday morning- be there, it’s FREE! June blooming Lychnis is done. Learn how to deadhead perennials on our free garden walkthis Saturday morning at 10. Feeding MATTERS! 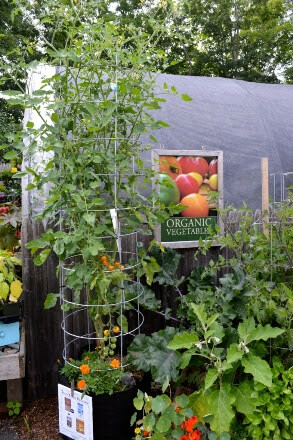 This is a double stacked tomato cage, held together with zip ties, all to hold up one ‘Sungold’ tomato in a Smart Pot. middle number in this formulation is higher than the first number. That boosts the flower power of the plants. Diane encourages everyone to feed every two weeks. She brags that she has 26 tomatoes on one ‘Lucky Swirl’ tomato in a pot on her deck! I have been following her advice and I have NEVER seen cucumber plants like I have now. They are HUGE! Everything in my garden is very happy. So happy, in fact, that I spent a lot of time this weekend staking. See my article about The Fine art of Staking below to learn how to do it correctly. 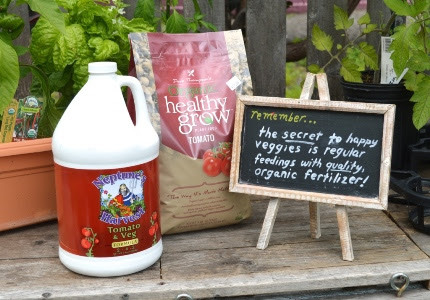 And do it BEFORE your plants need it. That’s the secret. Trust me on this. Did you plant garlic last fall? Are you wondering if it is time to harvest it? That seems to be the question of the week. Both Diane and I dug up a bit of garlic over the weekend. Neither of us felt ours was ready- the tops are still pretty green. I like to wait until the tops are mostly yellow which indicates the energy has moved down to the garlic bulbs. Dig a few and see how yours look. If they aren’t ready, wait another week. And THEN you will have a big, empty space freed up in your garden for the next round of fall crops- what we call here The Second Season. Calling all hummingbirds! 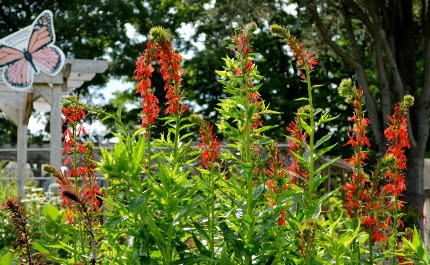 We have the best Lobelia cardinalis (native cardinal flower) we have ever had right now. Join me this Thursday evening for Facebook Live as I teach you all about The July Hummingbird Garden. This has become a monthly ritual. Right now it is absolutely hummingbird heaven here at the garden center. You can’t walk into the nursery yard without seeing a hummingbird somewhere. Even at home, they come right up to me while I am working, flitting from bee balm to fuchsia to phlox. We will have plenty of chairs set up if you want to watch how we do a live video. Every once in a while, a superior new plant comes along. 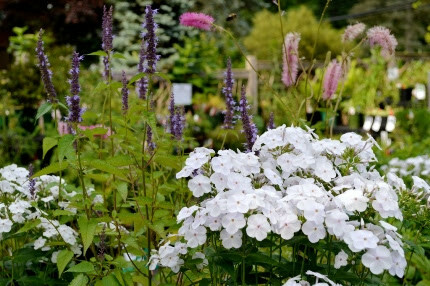 This is Phlox ‘Fashionably Early Crystal’, pure white with a soft lilac eye, 32″ tall, and thick, glossy, clean foliage. 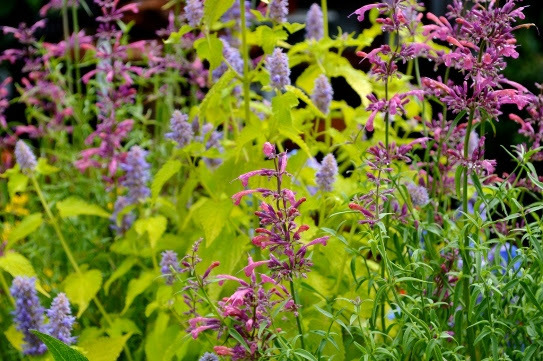 It pairs beautifully with Agastache and Sanguisorba, don’t you think? While you are scheduling fun things to do on your calendar, save the date: Thursday, July 27th from 5:30-6:30, please join me for a Wine Walk and a stroll through the Natureworks demonstration gardens in the evening. This is inspired by a book I am reading, The Cocktail Hour Garden by C. L. Fornari. I met her last month at a CT Horticultural Society event and am in LOVE with her book. We will have copies for sale that evening. She talks about the transition from the work day to the evening as “The Green Hour”. I love that phrase! C.L. is from Massachusetts. If you have a chance to see her speak, don’t miss it. Are you looking for your happy place? For me, it’s my garden. Come visit this week and mingle with the monarchs. So far we have released 41 monarch butterflies and have 88 growing in our “nursery” in various stages. The hummingbirds are everywhere. 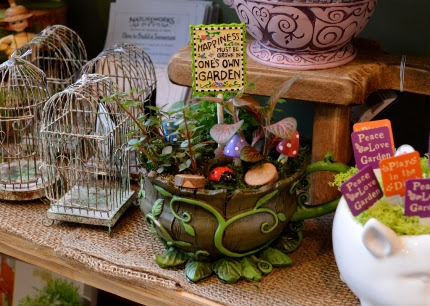 You will find the nursery relaxing, soothing, and a balm for the soul. Spend some time, sit and listen to the fountain, soak up the bird song. It’s summer and the gardens are glorious.